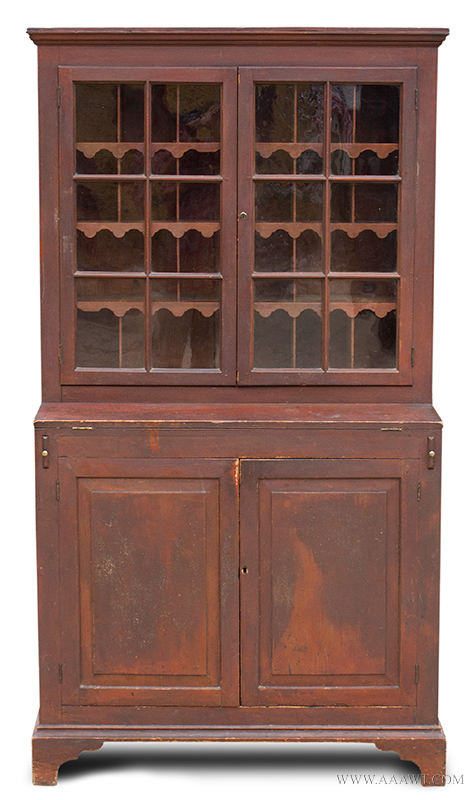 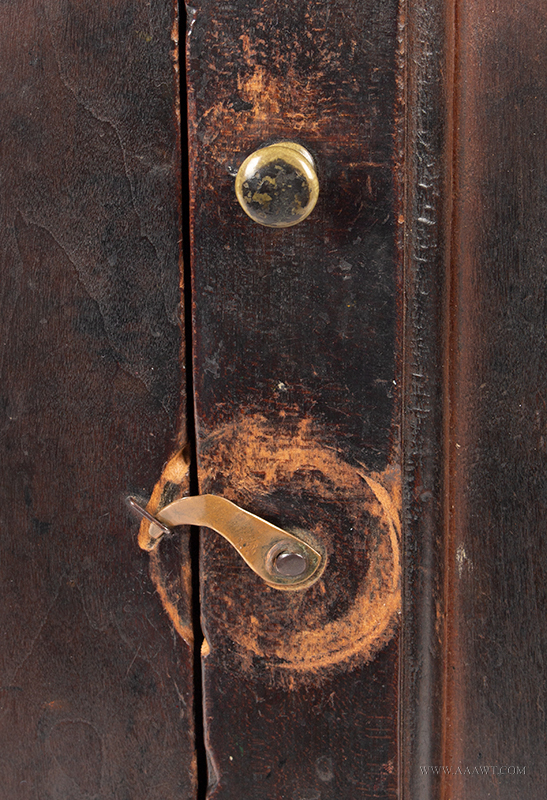 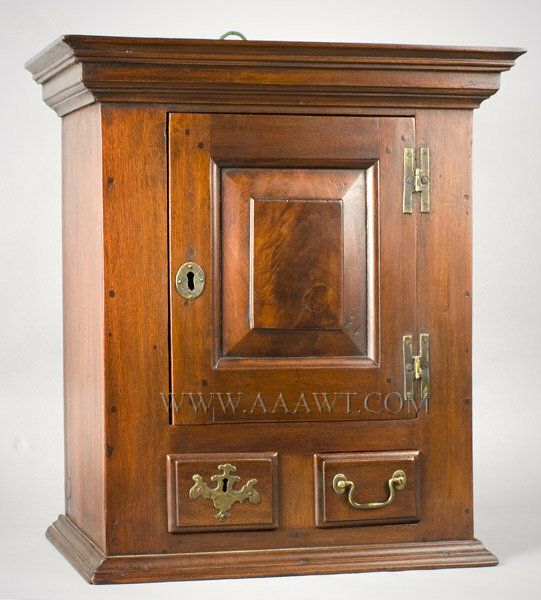 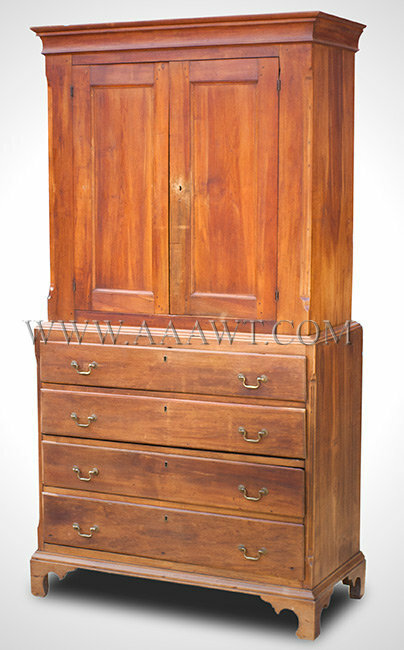 The beaded case with applied moldings displays three sunken panels on each side and features a three over two-drawer over paneled door arrangement; door retains original escutcheon and brass pull. 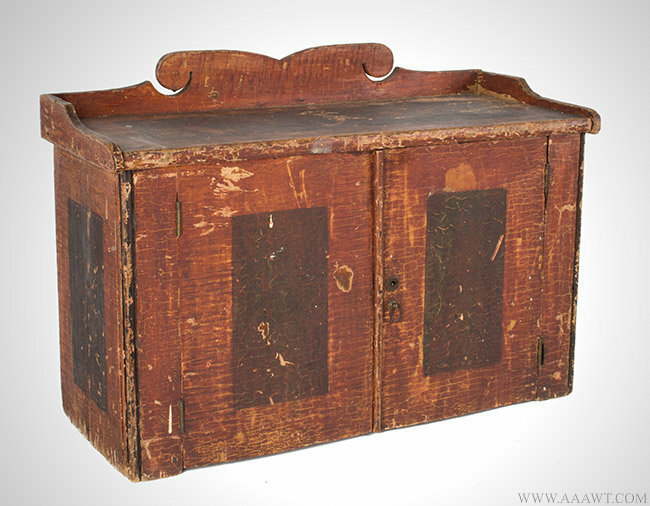 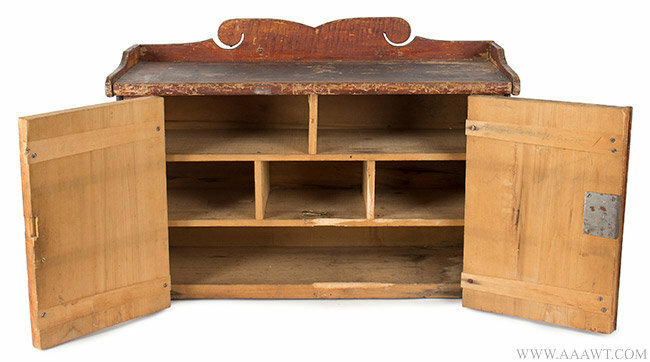 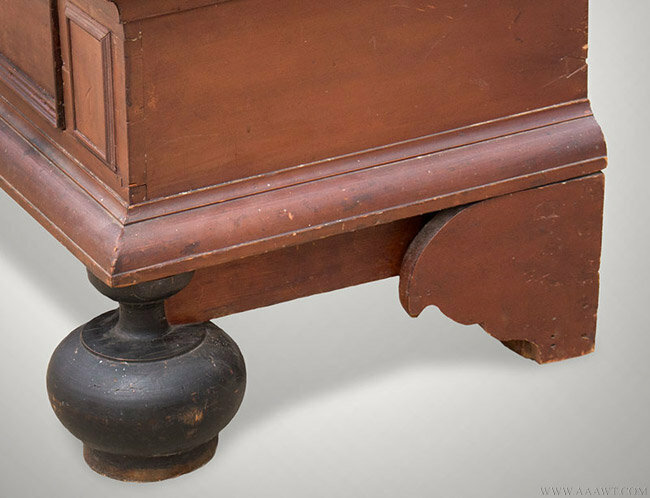 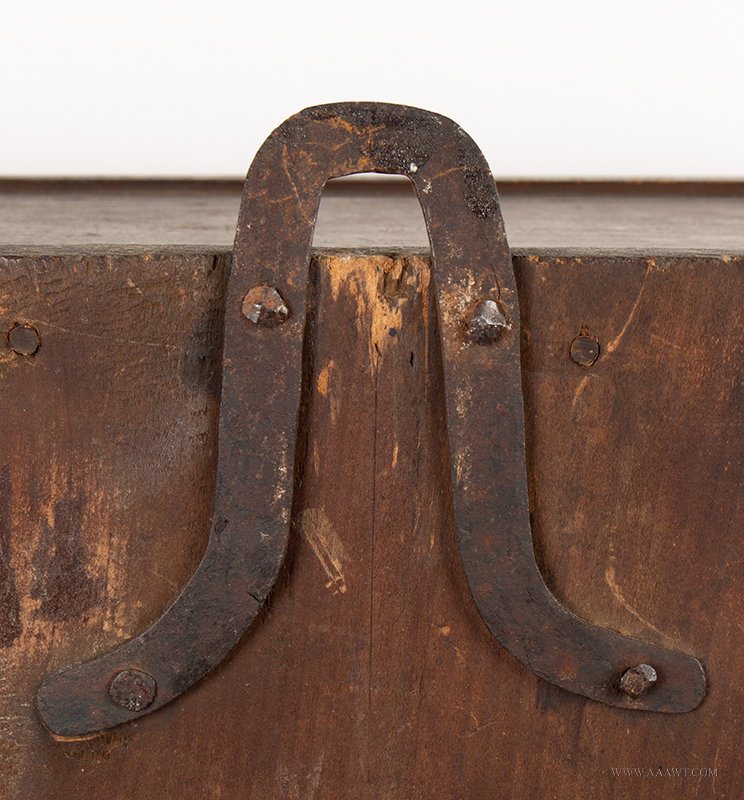 It is interesting that the top outside drawers were made to be used within a desks prospect compartment as is evidenced by the chisel notched finger holds on one side of each drawer secondary wood. 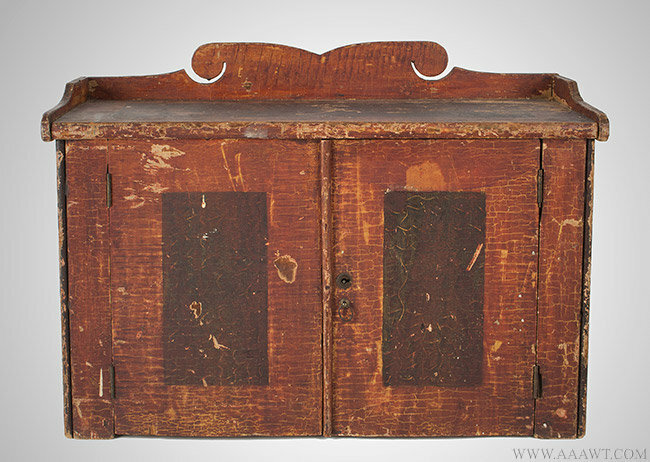 The drawer fronts are scratch-beaded. 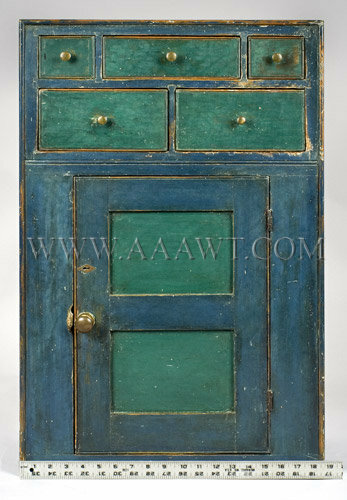 The lovely and original blue and green painted surface with terrific patina was expertly exposed by removing a layer of white over-paint. 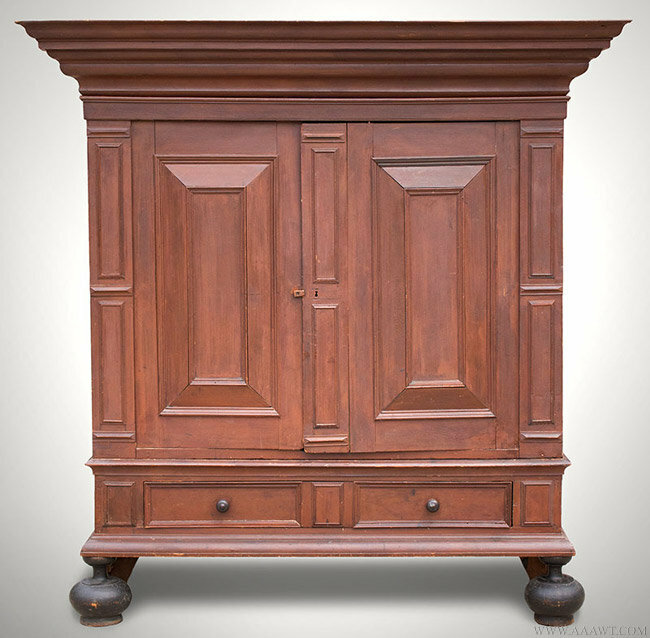 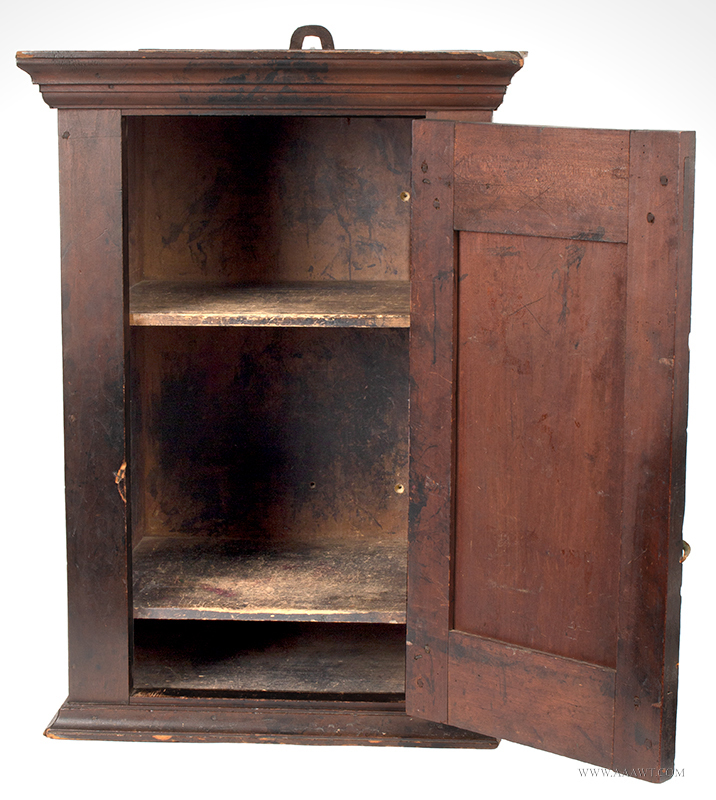 This molded country cupboard with single board door contains three shelves; original surface history of dry celery green over red over black paint. 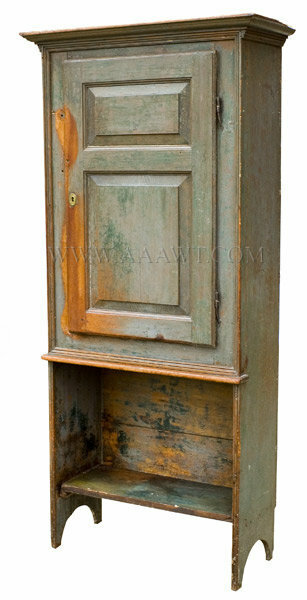 Dimensions: 87.5" high, 78.75" wide, 18.25" deep. 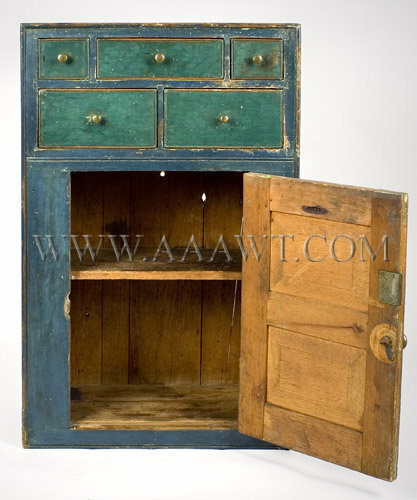 Contact David Hillier for additional information. 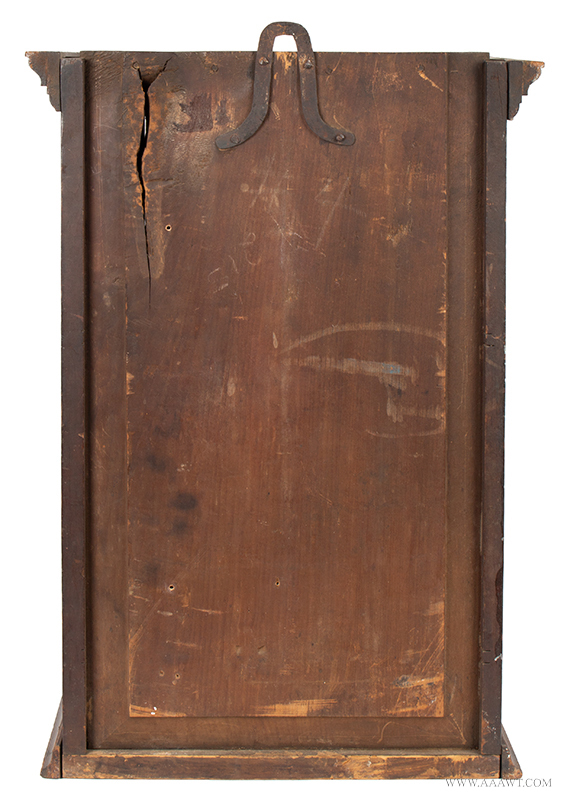 Measures 79.5" in height, 21.5" in width and 19" in depth. 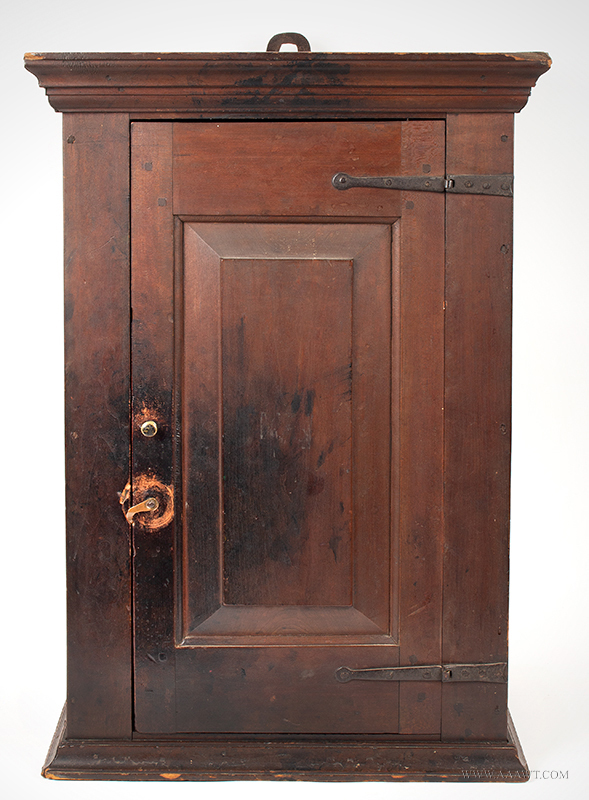 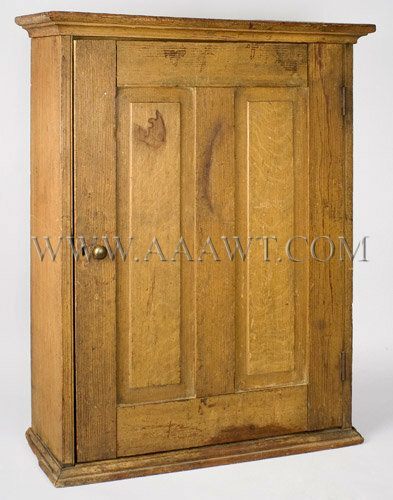 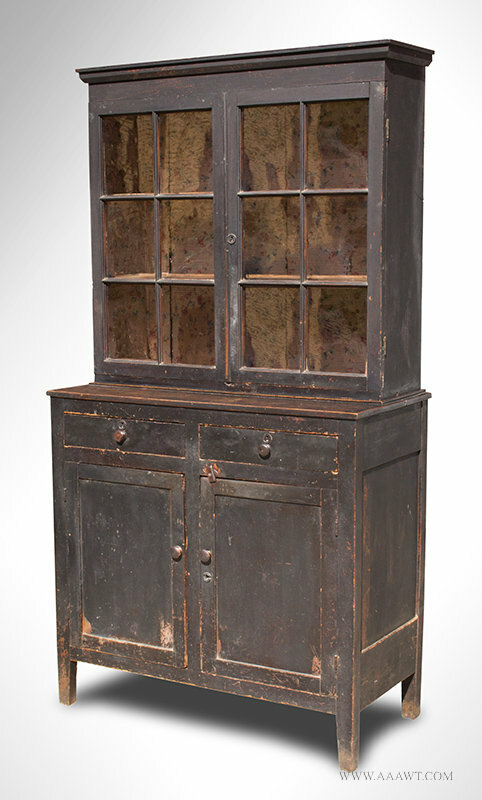 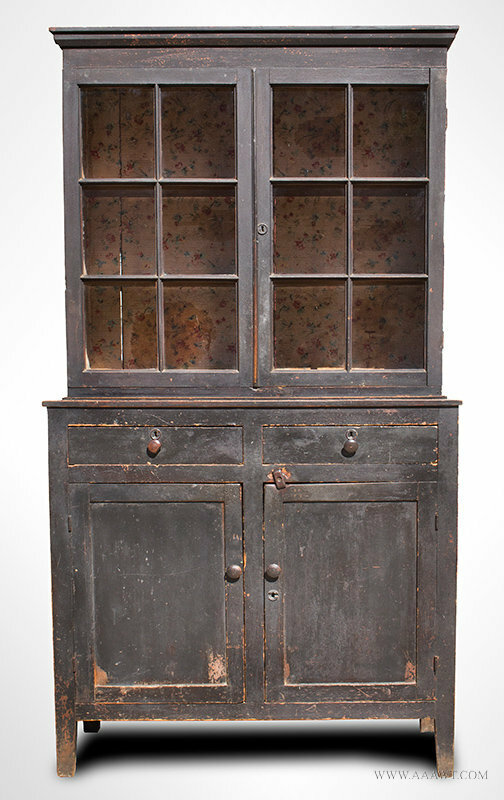 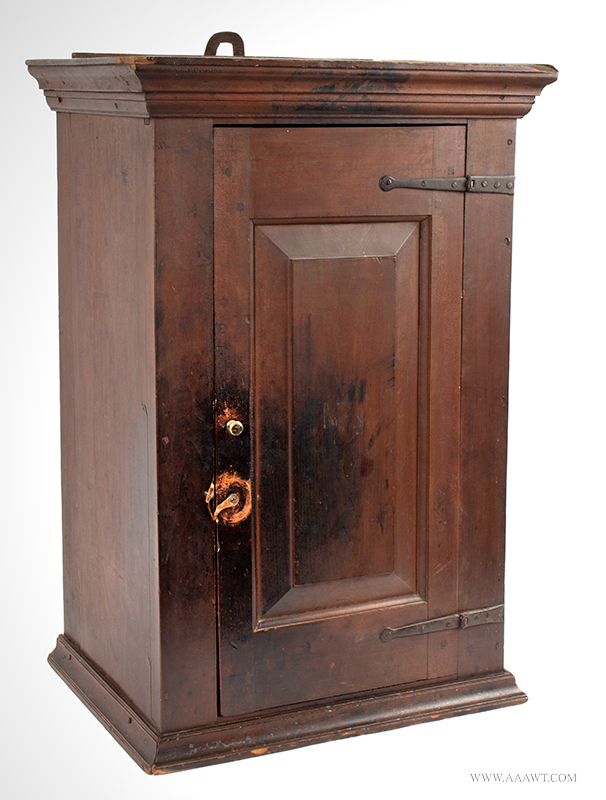 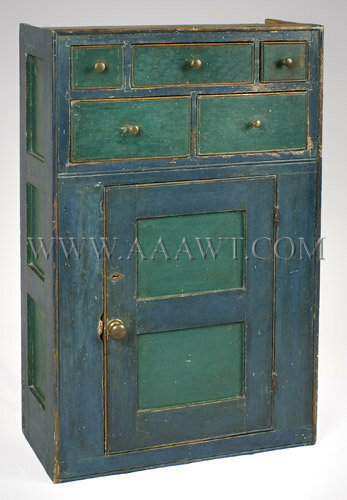 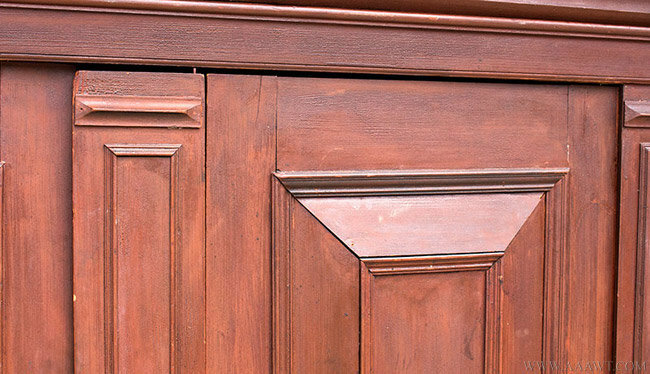 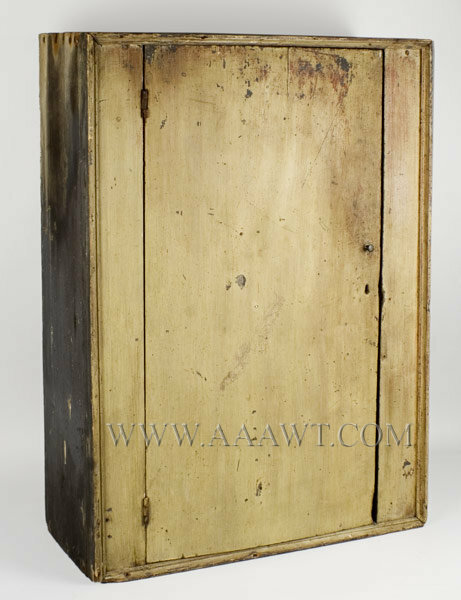 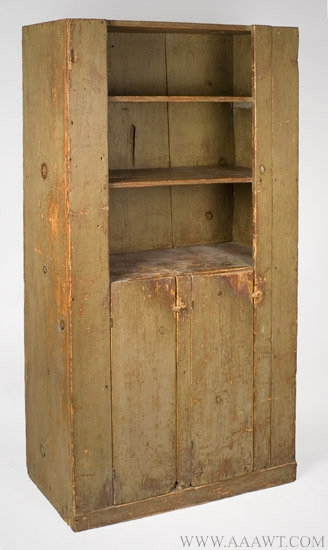 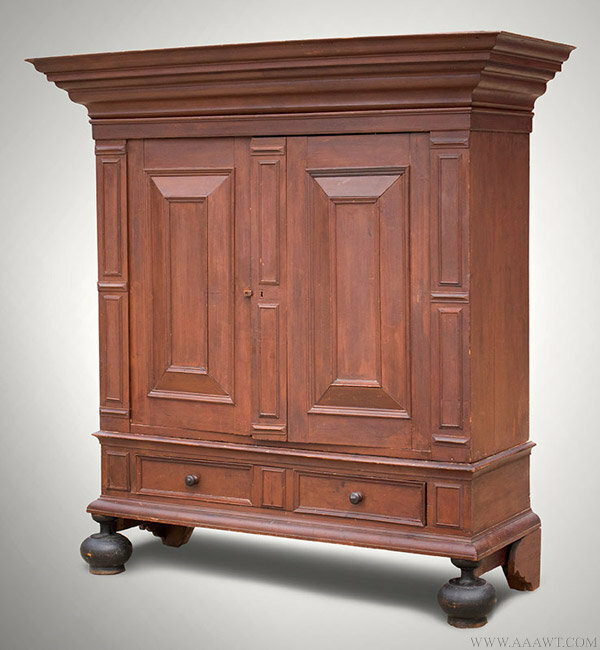 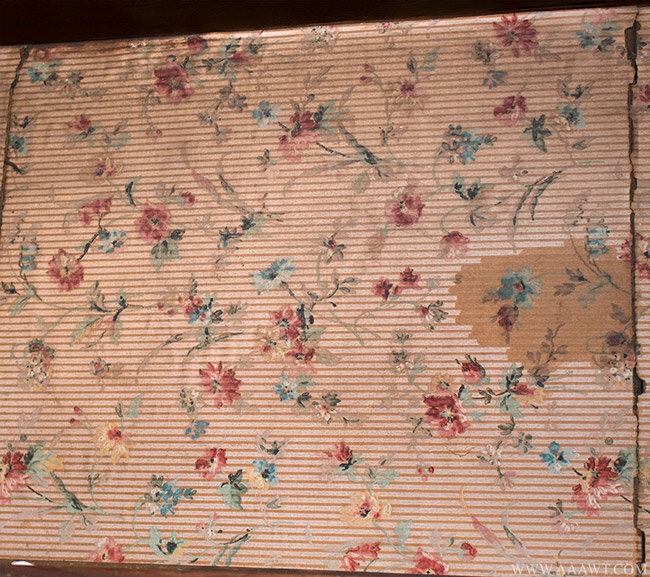 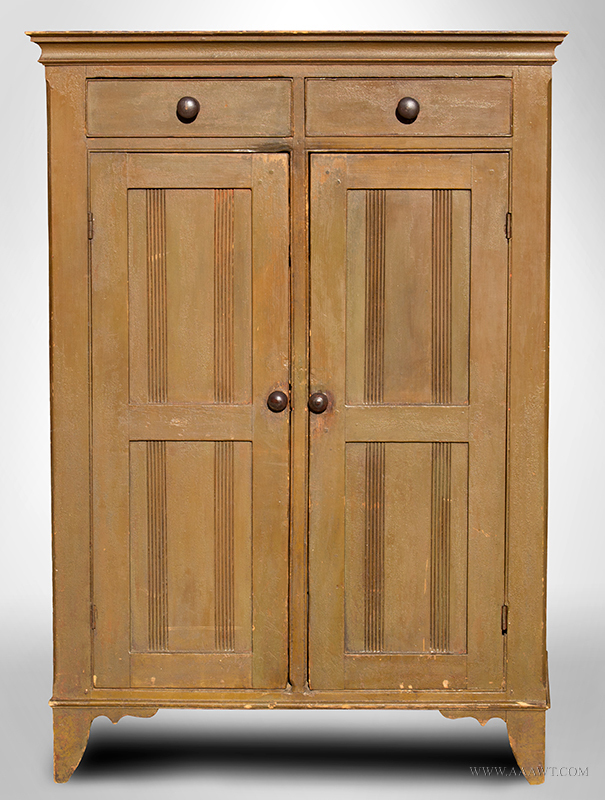 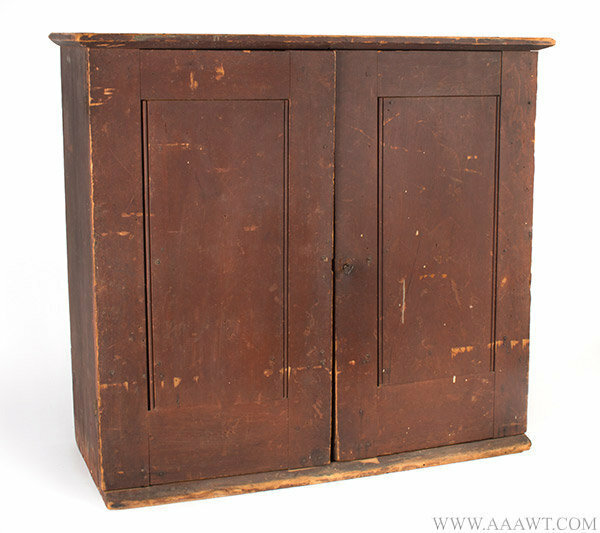 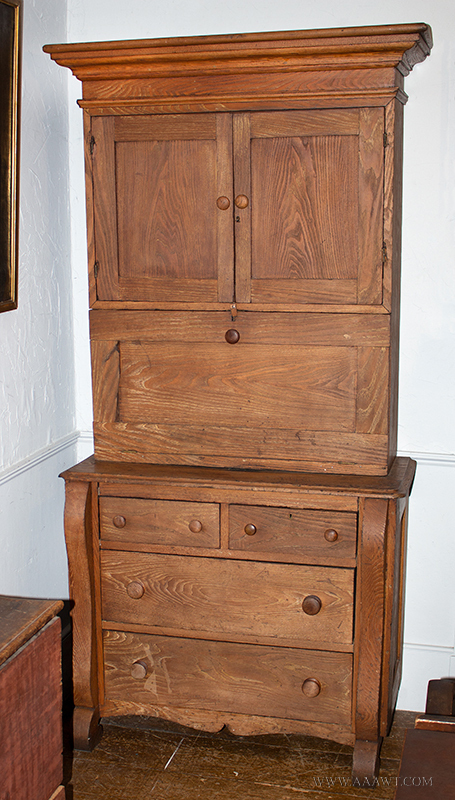 This early cupboard circa 1810-1840 has had minor touch up to paint. 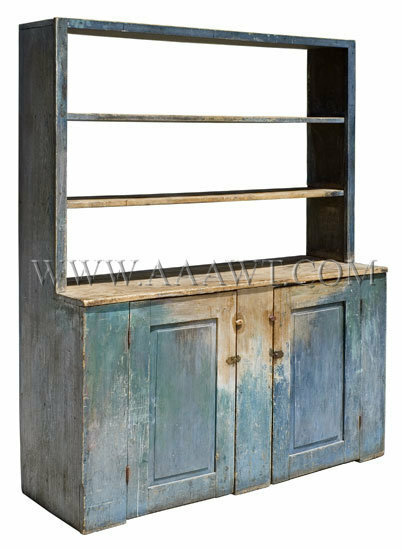 Dimensions: 75" overall height, 34.5" base height, 65" wide, 21.25" base depth, 12.75" shelf depth. 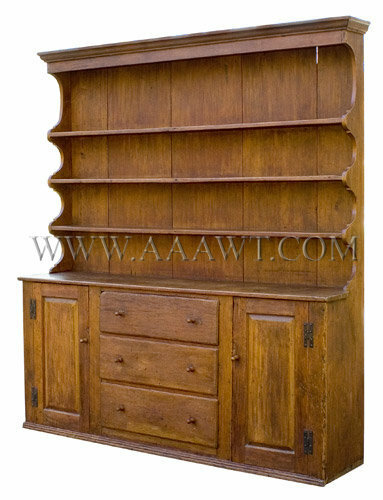 Great size at 40" tall by 24" wide. 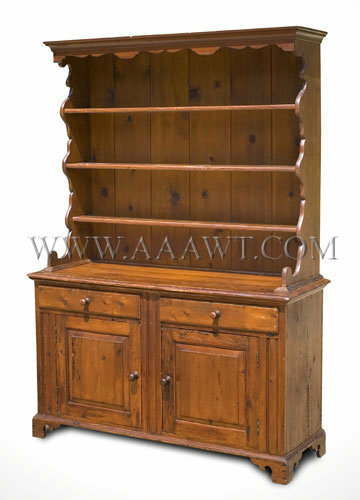 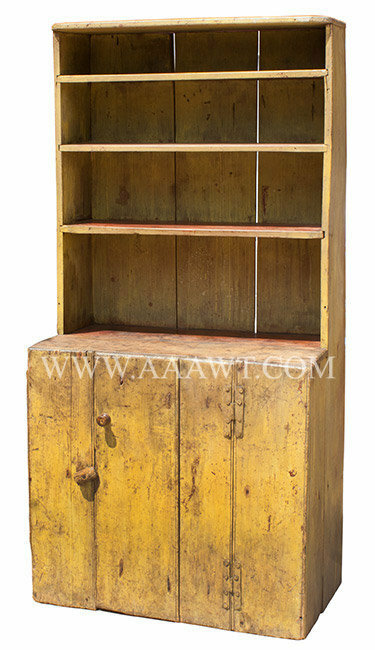 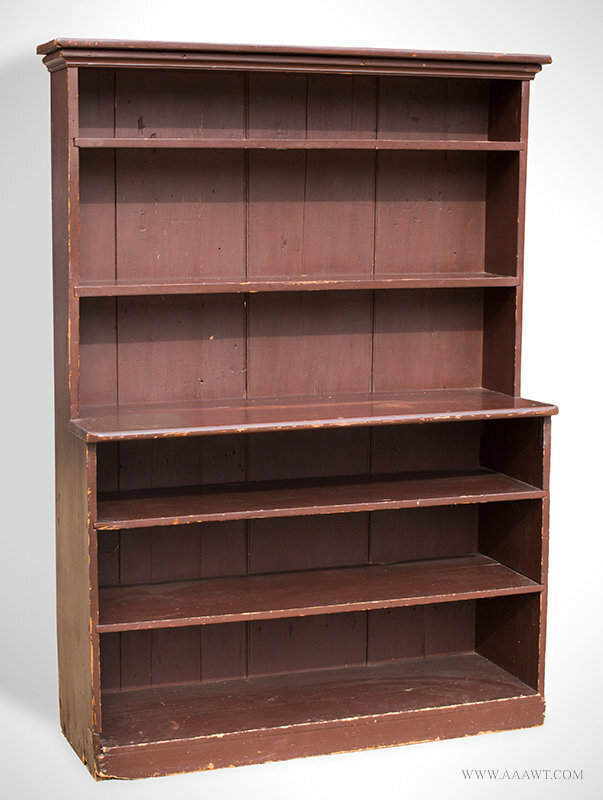 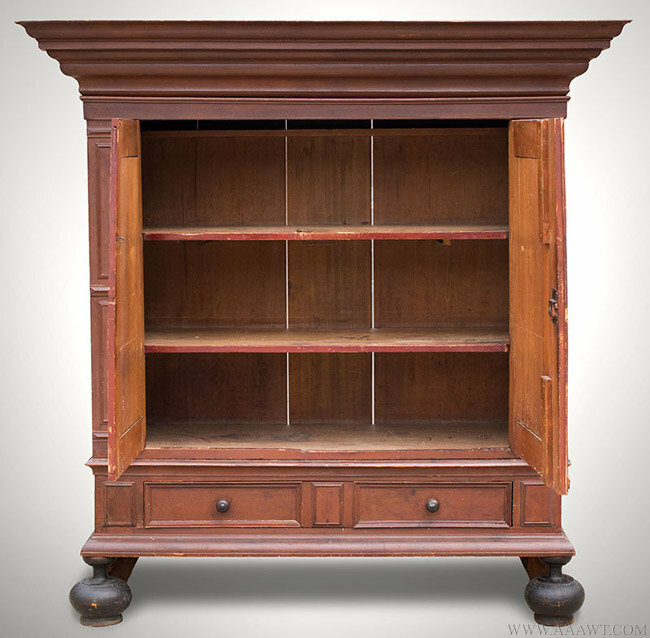 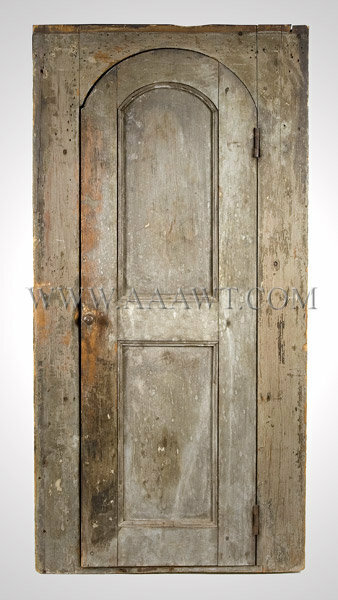 Paneled arched door with three interior shaped & molded shelves.